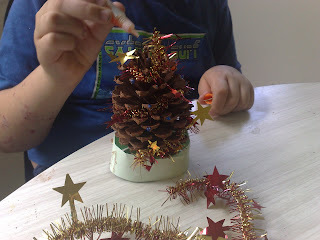 Todays craft was turning the everyday pine cone into a christmas tree. We have joining us today Miss T. She is suspect of having chicken pox, hense the socializing with my children. 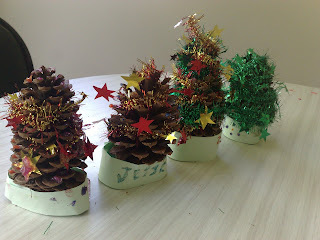 After all the pine tree falling around our house we went for a wonder and collected the nicer cones.We made a simple base out of coloured paper folded in half and taped around the bottom. 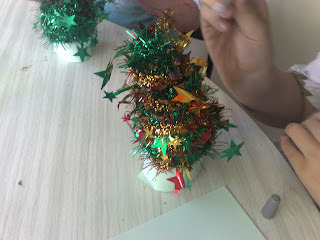 The kids have wrapped some tinsel string around their trees to give it some colour. This stays in remarkable well with no glue needed if you stick it in far enough. Then I found these really cool glitter glue pens that have two colours in each pen. The kids just dotted these around on the pine cone to give it some more colour. 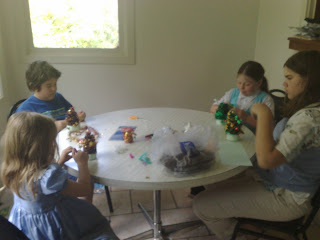 Miss E decided that her tinsel stars needed some on them as well. from left to right. Miss E, Master J, Miss Z and Miss T creations.